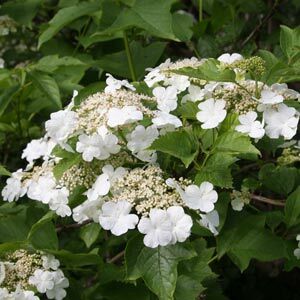 Viburnum opulus is also known as the Guelder Rose and European Cranberry bush and is probably best known for ‘roseum’ or ‘Snowball Tree’, a sterile cultivar which is cutting grown. 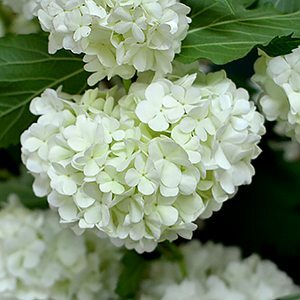 Producing masses of large long lasting white ‘snowball’ flowers in spring, V. opulus ‘roseum’ is a showy plant and like the species has nice autumn foliage to go with it. Widely used as a feature plant in the garden border or in the cottage garden. In the garden these deciduous plants grow well in full sun to part shade, more shade in hotter areas, they prefer a humus rich well drained soil and can be lightly pruned to keep in shape. Older growth and dead or damaged wood can be removed to promote a healthy plant. A little slow release fertilizer in early spring seems sufficient, but try to keep a cool root run, use well rotted compost and cow manure as mulch, but keep mulch well away from the base of the trunk. V. opulus ‘ Notcutts Variety’ is a hardy form with lace cap flowers.